few spares: impeller, props, engine hoses. Steel Freycinet barge type built in 1930 by the HACCOURT Yard and since transformed into a live aboard. Great accommodation in 4 cabins. Boatmans' cabin being transformed (15m2) with a double cabin & a bunk cabin available. Wheelhouse separated from the saloon. access to the living area from outside: all equipped galley, heads & shower. workshop in forepeak accessible from the foredeck and lodging the 12000 litre water tank with space for a blackwater tank if required. Stove in the saloon as extra heating and cosy cold evenings. large rectractable passerelle under the deck, easy to manoeuvre.huge sun deck under a marquise type full cover. Barge for sale in France. 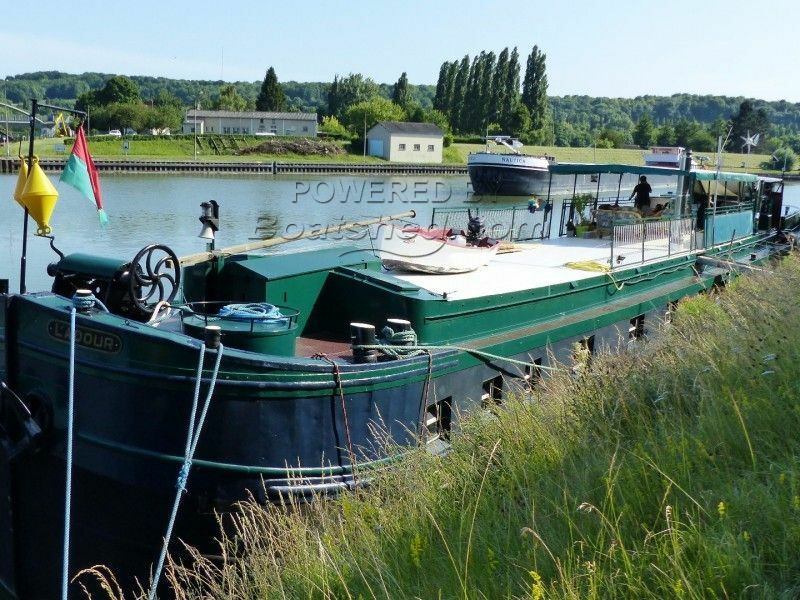 Boatshed Paris is happy to offer this Freycinet liveaboard barge for sale in Paris north region (only 30min away from Charles De Gaulle airport). This well transformed barge has been the pride of her owner and participated to several of the famous "Pardons des Mariniers"competition awards. Could easily accommodate a large family, 6 cabins and an extra room being finished to make a spare forward ensuite main cabin. Also ideal for a B&B project if required. Huge deck, with marquise, this barge is situated in a touristic region and mooring could be transferrable under request. Certificat communautaire valid til June 2020. For more information or organise a visit, please contact, Pascal GAETAN, your local broker at Boatshed Paris.